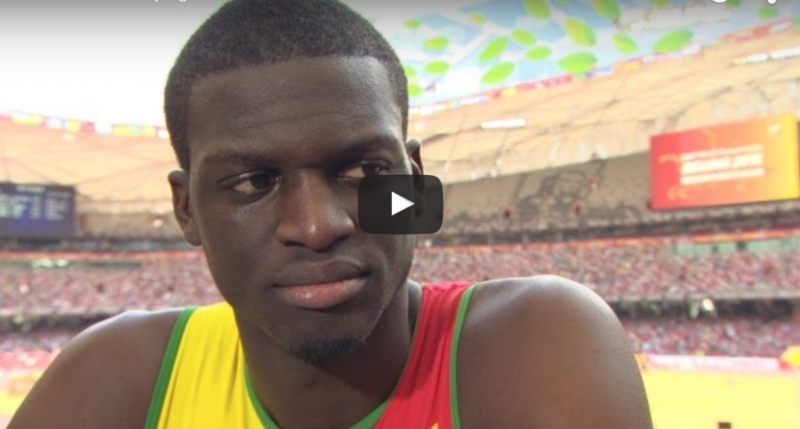 BEIJING, China, 23 August 2015 – Olympic champion Kirani James eased his way into the semi-finals of the Men’s 400 metres on the second day of the IAAF World Championships here on Sunday. James won his first round heat in 44.56 seconds to secure an automatic qualification to the next round, while Bralon Taplin, the other Grenadian quartermiler was eighth in the opening race and only managing 46.27. Luguelin Santos of the Dominican Republic and Lalonde Gordon of Trinidad and Tobago also joined James from heat four. “I think the race was good. It was very competitive. I try to be in control of the race as best as I possibly can,” James said. He said that his aim was to be competitive but to conserve as much as possible in this round. Earlier, Saudi Arabia’s Yousef Masrahi and Rusheen McDonald of Jamaica clocked the only sub-44s in the opening round of competition. Masrahi and McDonald were both given 43.93 in the second heat with world leader Isaac Makwala of Botswana qualifying in third position in 44.19. McDonald’s effort is a new national record and the first Jamaican to run under 44 seconds, beating Jermaine Gonsalves’ previous national mark of 44.40. South Africa’s Wayde van Niekerk, the only man to beat James this season, has also advanced to the semis with 44.42 in winning the final heat. Also heading to Monday’s semi-finals are Machel Cedenio (44.54) and Renny Quow (44.54) of Trinidad & Tobago; David Verburg (44.43), LaShawn Merritt (44.51), Vernon Norwood (45.53) and Bryshon Nellum (44.65) of the USA; the Belgium brothers in Jonathan Borlee (44.67) and Kevin Borlee (45.01); Peter Matthews (44.69) and Javon Francis (44.83) of Jamaica; Chris Brown (44.68), Michael Mathieu (45.07) and Steven Gardiner (45.26) of the Bahamas; and Martyn Rooney (44.45) and Rabah Yousif (45.24) of Great Britain.